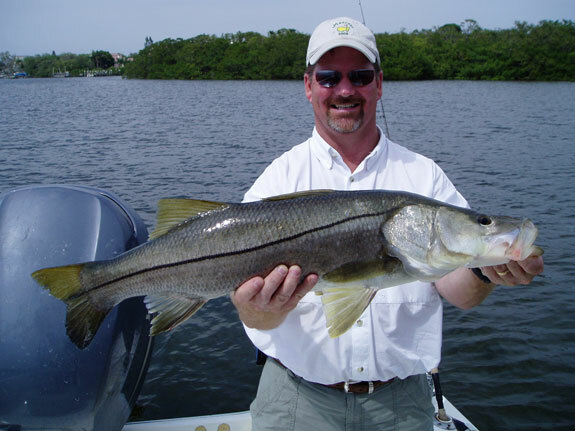 Snook are one of the most exciting gamefish in the waters surrounding Anna Maria Island. The snook has a most distinctive body shape, featuring a tapered head and snout, underslung jaw, large fins, and most distinctive of all, a prominent black stripe running the full length of the lateral line. Coloration is generally dark gray to black on the dorsal surface, shading to silvery on the sides. The fins are yellowish. As with many inshore fish, the coloration may vary with season and habitat. Snook in the back bay water usually have darker sides. Snook are one of the best for all around fighting ability. The fight is usually featured by several long runs and some thrilling jumps. Small snook leap high in the manner of ladyfish, while the really big females mange to clear about half their bodies. They are also masters at utilizing shoreline mangrove roots and any other obstruction to their advantage. The general size range is from 3-15 pounds. Snook weighing 20-30 pounds are not unusual around Anna Maria Island, especially around inlets and passes during the summer, when spawning takes place. A number of of Snook topping 40 pounds have been caught over the years on Anna Maria and Longboat keys. Their food value is ranked of nearly every ones list of favorite fish. The fillets are mild and flavorful. We generally use light tackle equipment and mainly cast live shiners into sandy holes with surrounding grass flats. Fly fisherman take their Snook on large streamers and poppers. Any small fish makes good live bait as do live shrimp and crabs. Large dead baits of ladyfish fished on the bottom have taken some very big snook.